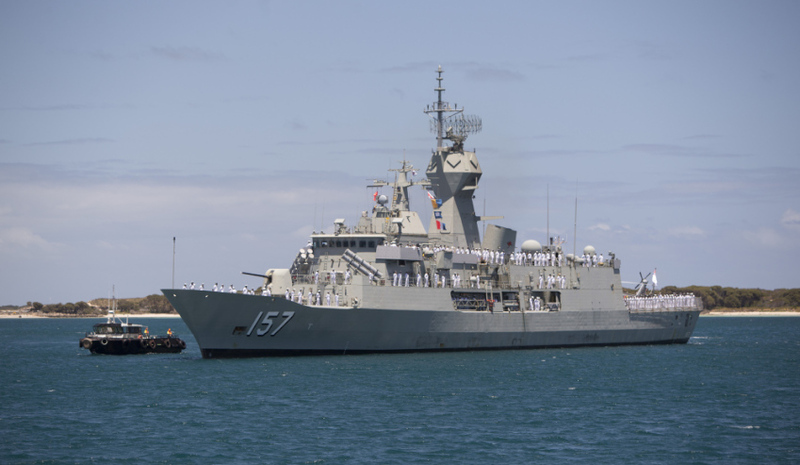 Anzac class frigate HMAS Perth. Image via Commonwealth of Australia, Department of Defence. Speaking at a recent Senate hearing, CEO of the Defence Teaming Centre (DTC) Margot Forster has outlined what the DTC hopes to see emphasised in the upcoming plan. "The Defence Teaming Centre suggests that we should define sovereign capability as 'the ability to design, maintain, sustain, enhance and develop defence assets and capabilities in Australia'," Forster told the Senate committee. Forster raised concerns that the DTC and others in the industry have in relation to sovereignty in Australia, stressing it is important that the government sets the right conditions/expectations from the outset in terms of investment in the country, the workforce and the local industry. "The concern that the Defence Teaming Centre has is that, to date, we have not had enough discussion around what sovereignty in this country is and what is defined as Australian industry," Forster said. "Industry that attended the sovereign industrial capabilities seminar hosted by ABDI back in July were rightly concerned by the Department of Defence's definition of an Australian company, which was 'any company with an ABN and Australian employees'. This simply does not go far enough. As a bare minimum, we could define an Australian company as one made up of and managed by Australian citizens. However, this could be seen as selling Australia short. "When defining what it means to be Australian, I suggest that we can do a little better than holding an ABN and employing Australians. We must insist that overseas companies invest in this country, develop technology here and have an ongoing commitment to Australia." As for which company is a leading example of a strong Australian defence business, Forster identified South Australia-based Saab Australia as an ideal example of an overseas company establishing strong Australian roots. "Let's look for a moment at an organisation like Saab Australia," Forster said. "Yes, Saab does have its roots in Sweden, but Saab Australia does significantly more than simply hold an ABN and employ Australians. They have a 30-year history in Australia and, in that 30 years, have invested significantly in people, education, research and development, technology and the security of this country. They now employ some 370 Australians – a number that will increase with their involvement in both the frigate and the OPV programs." Forster also stressed to the Senate committee Australian industry must be involved in the build of the upcoming naval vessels if the government hopes to see skills developed and export opportunities enhanced. "If Australian industry is not involved in the build of these major naval shipbuilding programs, it becomes increasingly difficult for us to develop the skills and the know-how and know why to eventually export them," she said. "While Australia is buying a foreign-designed frigate, we ultimately want to develop the design capability and expertise in Australia so that any shipbuilding programs following on from the Future Frigate will include both design and construction, with the opportunity to export Australian design ingenuity. "It would be remiss of me not to point out here that we do have design capability in this country. Austal already designs and builds ships competitively for the world. Just looking at Austal's contract with the US Navy, as I understand it, after a certain period of time only US citizens can work on the program. This is a requirement that the federal government should seriously consider implementing here." The sovereign industrial capability plan was due to be released in July this year. Defence Connect has been advised that the release is “imminent”.